1 Bedroom Flat For Sale in Eastcote, Middlesex for Asking Price £300,000. Perfect for First Time Buyers is a new selection of contemporary 1, 2 & 3 Bedroom apartments located in Eastcote. This Second Floor 1-Bedroom home offers a fully fitted Kitchen with integrated appliances, Porcelain tiled Bathroom and flooring. Solis is a new landmark development by Developer, Life Less Ordinary, offering a stunning collection of contemporary apartments. The area has a village type feel with many open green areas and a range of independent shops lining the high street. With excellent links to Central London from Eastcote underground station (Metropolitan & Piccadilly line) and also having the benefit of a number of local amenities on your doorstep, Solis is perfectly placed for young professionals and First Time Buyers alike. 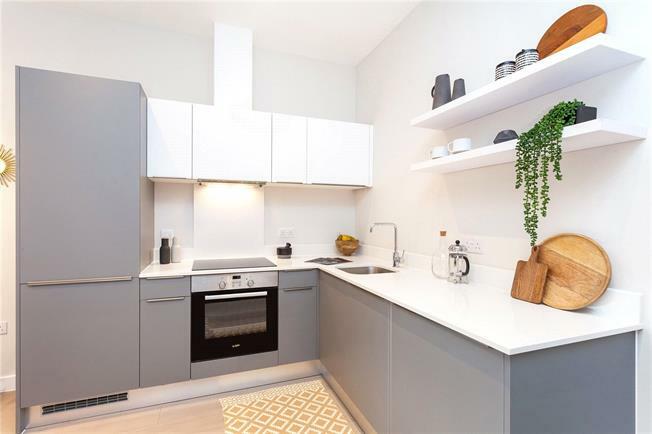 - Contemporary bespoke Kitchen with soft closing doors/drawers, stainless steel recessed sink with chrome mixer taps, integrated Bosch appliances to include stainless steel single fan oven, ceramic hob, fridge/freezer and washing machine, slimline dishwasher. - Bathroom with Porcelain tiling and white sanitaryware. Hansgrohe brassware and thermostatic showers, wall hung wc and basin with storage. Chrome heated towel rails. Bespoke fitted wall mirroring with downlighting. - Engineered wood flooring to Living Room, Kitchen, Hallway. Carpet to Bedroom. - Thermostatic electric panel radiators. - Recessed downlighters to Living Room and Kitchen. - Multi socket to Living Room. TV point to Bedroom. - Private gated access to resident parking bays and cycle storage. - 10 year Builders Warranty. To arrange an appointment to view, please contact Preston Bennett New Homes on 0208 954 8626.